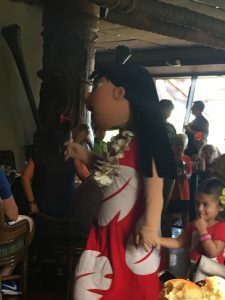 Best Friends Breakfast featuring Lilo & Stitch at Ohana in the Disney’s Polynesian Village Resort is one of Disney’s Worlds most popular Character Meals. 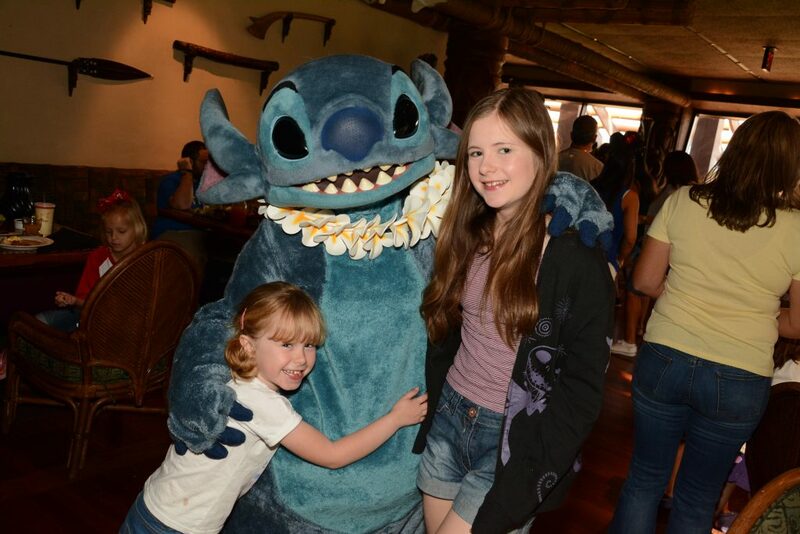 We recently visited Ohana Breakfast and had a great family breakfast with Lilo & Stitch. 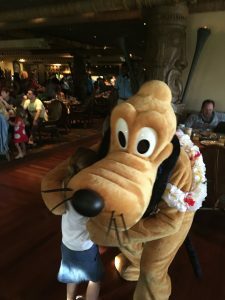 Lilo, Stitch, Mickey and Pluto are the stars you will meet at this popular dining site. 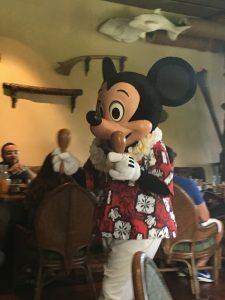 Ohana is a character meal at breakfast only and in the evening provides a Hawaiian themed experience. The restaurant is very popular and you must book an advanced reservation. The Disney Dining Plan is accepted. 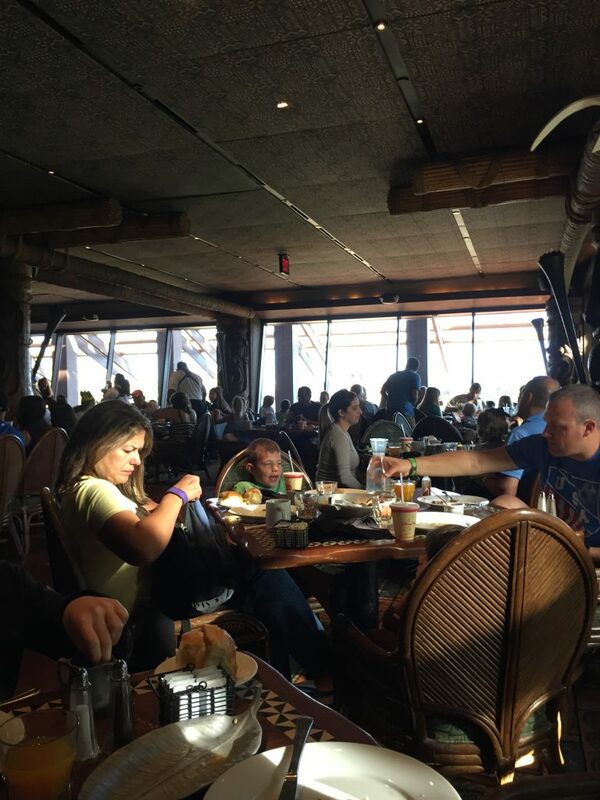 Ohana Breakfast is at the Polynesian Village Resort on the 2nd floor. 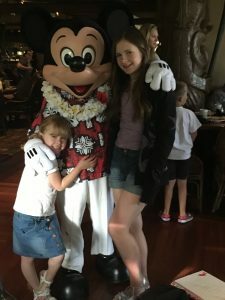 The Polynesian Resort is one of Disney World’s most impressive resorts and the Ohana does not disappoint. The restaurant is beautifully decorated with Tikis at the entrance. Meals are served Family Style(large platters) to your table and you will be served scrambled eggs, potatoes, sausages, bacon, Mickey Waffles, bread & fruit. Juice, milk and coffee will also be served with your food. 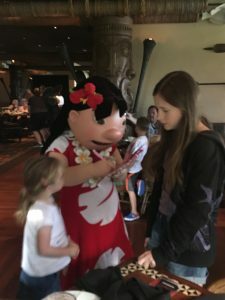 Ohana Breakfast is great for allergy sufferers. Our daughter is lactose intolerant and she was served her own dairy free Mickey Waffles and Scrambled egg brought to the table by a chef. Like most character meals the quality of food is not fantastic but the is plenty of it. Plus you can ask for 2nd or 3rd helpings if you want. 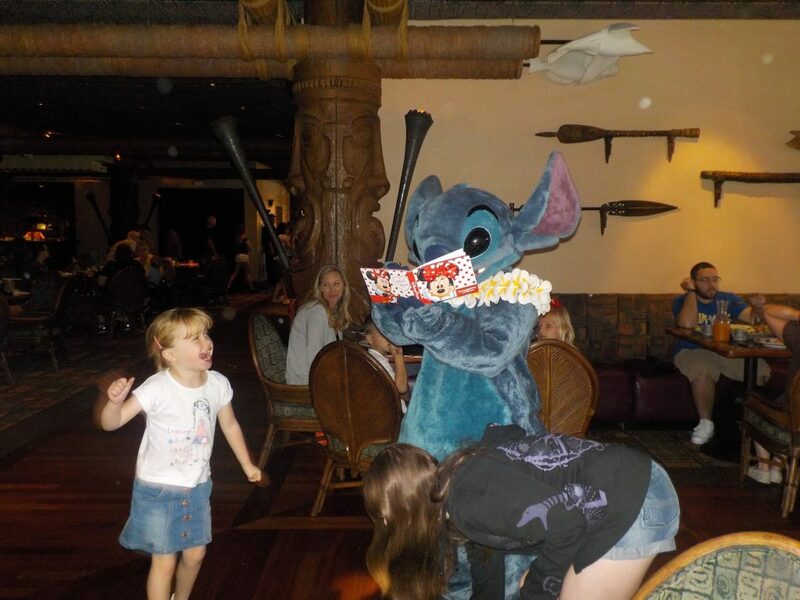 But…Hey….Food isn’t what you came to Ohana Breakfast for is it? The star attractions are most certainly the characters especially Stitch who maintain his popularity as one of the must do Disney Characters. Each will visit your table in turn for photographs, hugs and autographs. Interactions are very brief but are great fun. 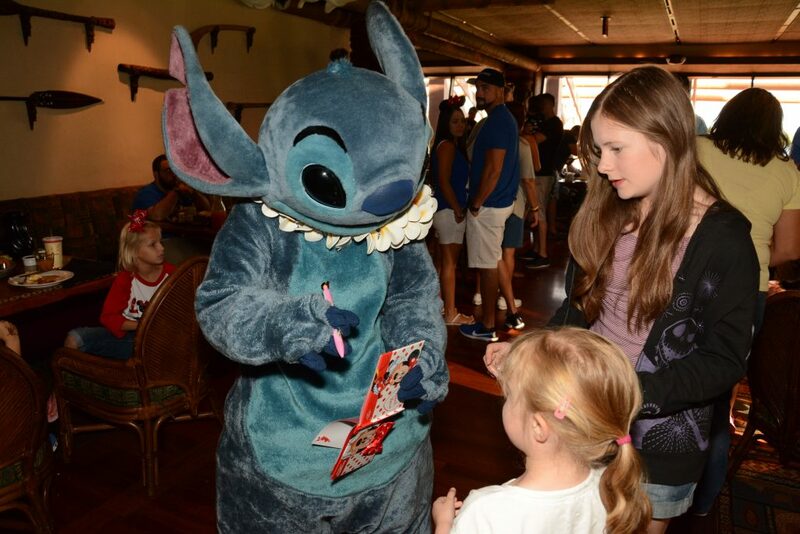 The will also be the opportunity for kids to take part in the “Ohana Family Parade” with their favourite characters. Ohana; which means family; is great fun and has a great family atmosphere. You waiters are called “cousins” and will look after you throughout your meal. Food is hot, fresh and abundant but perhaps not the best in Disney World. 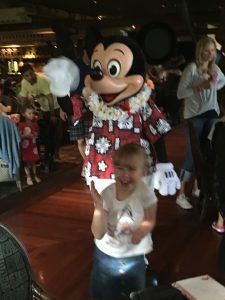 Kids will especially love the experience and Ohana Breakfast is highly recommended. Have you been to Ohana? let us know what you think below. Ohana Breakfast is allergy friendly. 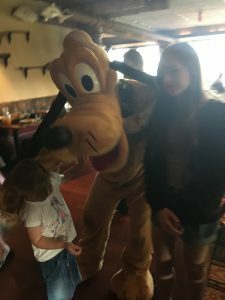 Find out more about dining at Walt Disney World with allergies here. 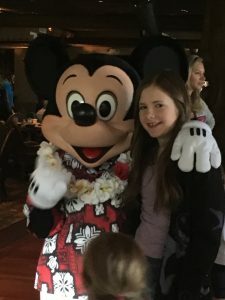 Lear all about the Disney Dining Plan. 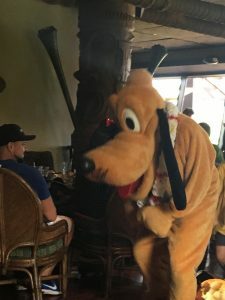 The are plenty of other Character meals at Walt Disney World where you can meet Characters including Pooh, Tigger, Chip, Dale, The Disney Princesses and many more. 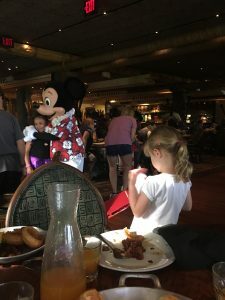 We have a complete guide including video footage to all Walt Disney World Character Meals here. 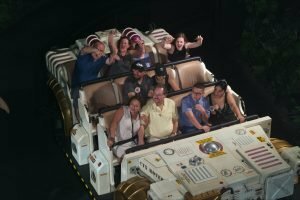 If you want to find out more about Walt Disney World why not have a look at our Beginners Guide here?